Maddy Myers: I watched barely any TV shows as a child, but She-Ra was one of the few approved programs in my household, which means that I had a healthy level of nervousness about the Netflix reboot. While watching the first couple of episodes, I felt a bit thrown off by how different the show looks and feels from the original. In the end, I fell in love with it, and now I feel very lucky that this was the rebooted adaptation that She-Ra got. This new version adds some unexpected nuance to the concepts of the original, while still being an adorable, feel-good show that a kid can enjoy. Fahey, did you watch the original show? Did you have to get used to the changes, or were you totally on board from the jump? Mike Fahey: I watched the original show when I was an older child than you were. I was into He-Man, and She-Ra was a spin-off that was He-Man enough that I didn’t mind watching it, despite not appreciating flying unicorns and princesses as much as I do as an adult. Initially the changes threw me, but the more I watched the more I realized that this was a cartoon that didn’t need a He-Man connection to keep my attention. Maddy: Yeah, He-Man isn’t even mentioned! Which is fine by me. As a kid I mostly knew He-Man and Skeletor as the guys who had a cameo appearance in the She-Ra Christmas Special, which was a big crossover event between the two shows that gave equal billing to He-Man, not that child-me cared about him. The rebooted version of She-Ra still tells the same story of Princess Adora getting kidnapped by the Horde as a baby and getting raised by “bad guys” until she learns the truth about them. In the reboot version, Adora’s defection from the Horde is treated as a much more emotional and intense decision. That’s mostly due to the new and improved version of Catra. Rather than being a whiny, hissing villain who irritates She-Ra (and the viewer), she is now one of the best-written villains I’ve ever seen on any show. Which I did not expect at all. Fahey: Well, the original show was meant to sell toys, so it didn’t need much in the way of character development. Just show them doing cool things, get the kids excited. This time around every character has added dimensions, especially Catra. Honestly, I had a hard time thinking of her as a villain. Every time she and Adora met up I found myself hoping Catra would stay with her. The damn show kept making me excited about their relationship. Catra sleeping at the foot of Adora’s bed. The dance scene at the Princess Prom. Adora and Catra, such a great couple. If only there wasn’t good and evil. And it’s not just the big moments, either. There’s a bit in one of the latter episodes where Catra catches Adora before she falls into a chasm. As she steps away, Catra brushes Adora’s wrist with her tail, and Adora smiles. Small details with big impact. This new She-Ra may not have been designed to sell toys, but maybe instead it was designed to get fangirls to write fanfiction and make fan-art about Adora and Catra. What a powerful promotion machine to harness! Okay, I don’t really think they’re doing that on purpose, but they’re such a perfect pairing, it’s ridiculous. There are also some actual queer couples on this show. There were some women kissing in the background of Princess Prom, for example, and I’m pretty sure Netossa and Spinnerella are dating, since they’re always together and have their arms around each other and stuff. Pretty cool! Fahey: “It’s right there in the name. Net-tossa.” My wife and I were talking about Netossa and Spinnerella before the final episode, wondering if we were going to see them in action. We cheered when they showed up together. I have a hard time picking my favorite princess, though. There are just so many. I mean, going by My Little Pony: Friendship is Magic rules, even Swiftwind is a princess, because he’s an Alicorn. If I were hard-pressed, I would have to say Bow is definitely the best princess. Adora, Glimmer and Bow, the best princess. Maddy: This version of Bow is so wonderful. That’s helped a lot by Marcus Scribner’s voice acting; he brings a lot of gentle comedy to the role and really fleshes out what started as a kind of boring “token guy” character. Now he’s more of a “token human” character, like Hawkeye in the Avengers (except, uh, the comic book version, where Hawkeye gets to actually be funny). 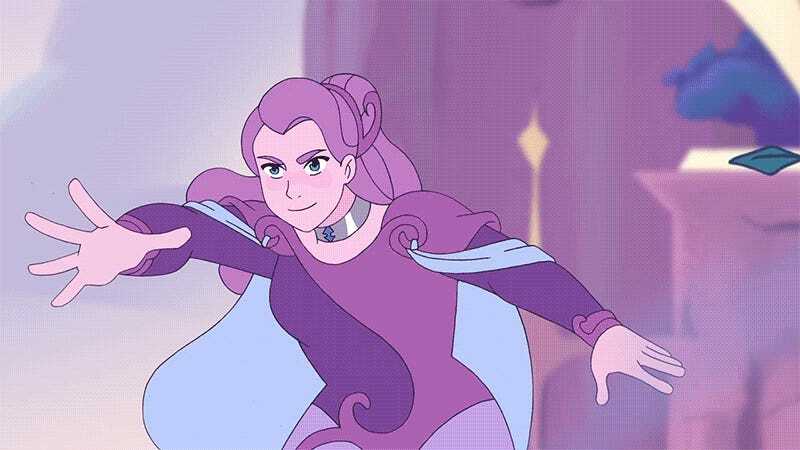 I also love that in this version, Glimmer has more interesting powers, and her relationship with Bow is more complicated. I think Mermista is my favorite princess but, dang, I can’t decide. Fahey: Well, you can’t have Mermista without Sea Hawk, the most adventurous adventuring adventurer (and sometimes inspector) who ever adventured. His joyous buckling of swashes is infectious, and now every time I see a boat, I will want to set it on fire. And then there is Entraptra, the hyper-focused techno-genius. She reminds my wife and me of our children, which is wonderfully frightening. Hopefully they won’t develop prehensile hair. Speaking of amazing characters, who’s your second favorite character on the Horde side? Hint: it’s not Kyle. Maddy: Oh man, how can I not say Entrapta? Her arc was so fun because I knew she was a villain on the original show, and yet I genuinely thought that this time around they were changing that. I loved my Entrapta doll as a kid, and I often had her defect and fight with the good guys because her hair was so cool. So, I figured that maybe the showrunners had the same thought. Nope! They were just playing the long game with her. 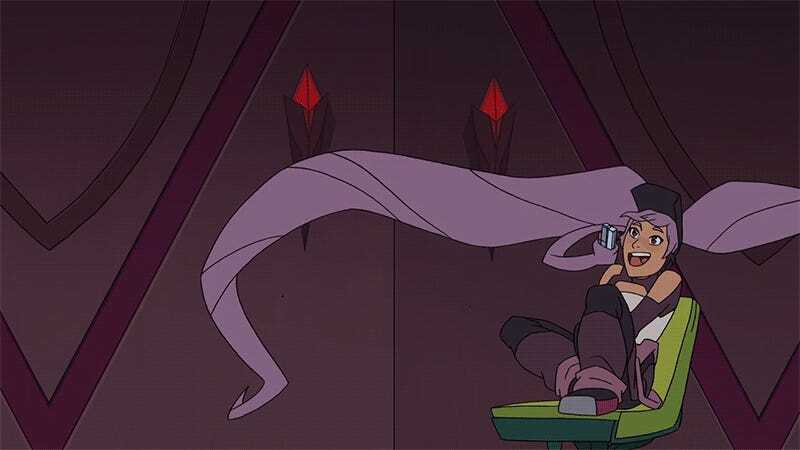 Anyway, I love robots, so I gotta love Entrapta, and she also helpfully serves as the exposition character for all the details that this show has added to She-Ra’s techno-magic origins. Entraptra is so much fun. I really loved how by the end of the season, we had these three wonderful characters on the Horde side (Catra, Entrapta and Scorpia), all of whom you can’t help but root for. Except you also have all these charming characters on the “good” side. Like I said, it really gave me some mixed feelings about the outcome of that final battle! We haven’t even talked about the new manipulative-yet-motherly version of Shadow Weaver yet. I love her too. I love everyone. I love the new She-Ra. Fahey: I was secretly hoping you were going to say Kyle, but I get it. See, I’m still thinking of Entraptra as a good princess that’s just doing her own thing. She’s not evil, she’s just driven by different motivations than either side, and the Horde just happens to have what she needs. Scorpia and Catra made a big deal about her friends abandoning her (they thought she was dead), but all they really had to do to convince her to be on their side was show her some robots. Scorpia was my favorite villain. So large, so caring, so matter-of-fact about her family bowing down to the Horde from the get-go. She’s silly, and I love her. Plus she is voiced by Lauren Ash, who plays Dina on the sitcom Superstore, which is secretly one of my favorite television shows. Shadow Weaver was really the only character I was disappointed with. Hopefully we’ll explore the relationship between she and her “children” in season two, because I feel like that wasn’t given enough play this time around. Maddy: I liked Shadow Weaver because I feel like there aren’t enough shows with complicated mother/daughter relationships, but I see what you mean about that not being a big part of the debut season. 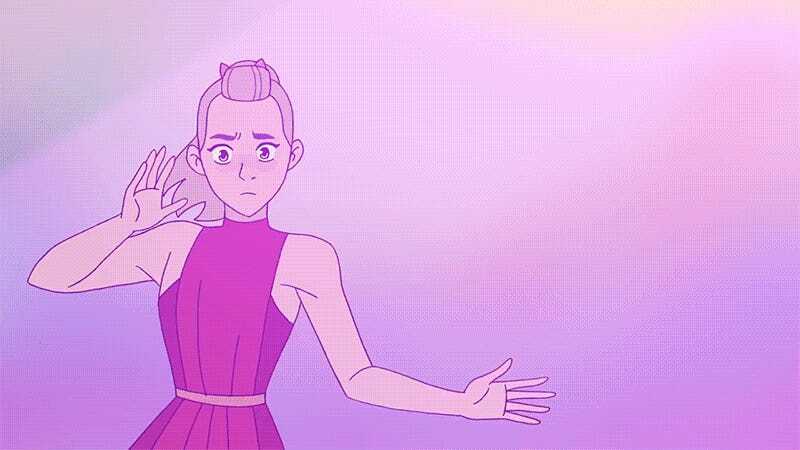 It would have been cool to see more of that, but this first season mostly focused on Adora’s relationship to Catra. I also liked that Hordak was more of a distant evil patriarchal figure who was playing these ambitious women’s motivations against one another for his own ends. It’s a nice contrast to the “good” side, which doesn’t have a dude pulling the strings in the background. Shadow Weaver was always pretty incompetent on the original show - as were all of the villains - but that seemed like a waste to me back then, since she had such a cool, spooky design. I’m not sure where her story is going to go, but I liked this season enough that I’m hopeful about future seasons (which are going to happen, right?? please???). Hordak, mostly appearing on viewer. Fahey: Hordak being more of a background figure pleased me. I went into this expecting him to be chewing up the scenery every episode, but he’s just the random guy in charge here. It fits, because this isn’t a show about him. It’s a show about the relationships between a group of young women. It’s about growing up. It’s about responsibility. It’s about the strength of friends working together instead of letting a legendary hero do the work for them. She-Ra isn’t a solution. She’s a catalyst, helping the princesses of Etheria forge and strengthen bonds, harnessing a strength they already possessed. The show is well-animated, expertly-voiced and filled with heart. It’s a beautiful thing. Maddy: I agree. The show went way beyond my expectations, and in ways that I never would have predicted. I can’t believe they managed to take a show with character names as corny as “Catra” and “Scorpia” (because they’re a cat and a scorpion, get it?) and turned it into a moving story about the motivations that people have for doing good, doing evil, and every choice in between. 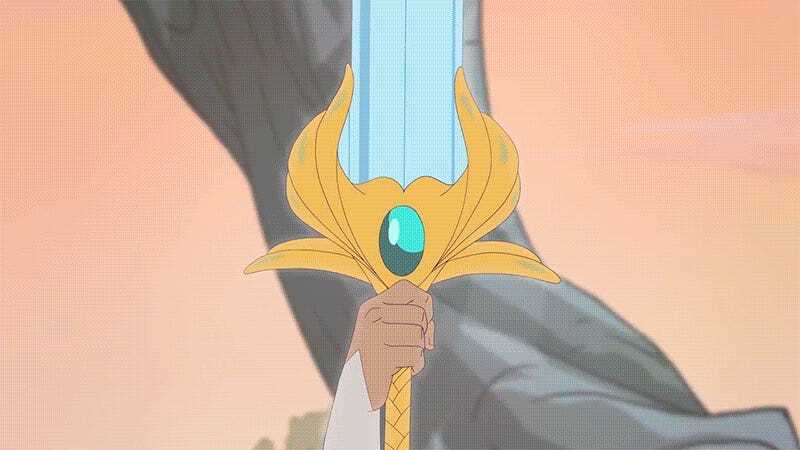 She-Ra may have started as a cutesy show to sell toys, but now it’s a lot more complicated and poignant, and that is just so cool. But if they made these versions of the characters into toys, I would definitely still buy them. All of them. So if it turns out that was their secret long game, it worked.